An approach to architecture practice offered by Brian Donovan, principal architect of the former Donovan Hill. Donovan presented his work last week in the first instalment of a new lecture series, Zeitgeist. The series is a collaborative effort between the Centre for Cultural Materials Preservation and Robin Boyd Foundation, and will be held on the last Tuesday of each month for the rest of the year at the Foundation’s Walsh Street premises. Charged by this unusual yet complimentary combination of archival and architectural interests to discuss the relevance of material in his work, Donovan spent the majority of his time presenting the extraordinary C House (1998). He followed this with discussion of recent commercial high rise projects, Santos Place and AM60 Office Tower (both 2009). Question time went on for considerably longer than was allotted and was almost exclusively focussed on the recent and surprising merger between Donovan Hill and BVN to become BVN Donovan Hill. C House was the result of a meticulous design and construction process, one that spanned four years in the studio and a further five years on site. In order to save costs associated with the co-ordination of multiple trades, most operated independently of one another in a protracted linear sequence. The upside of this approach was a careful and highly detailed relationship with the trades as they each progressed through their section of the works. Principle among these were the carpenters, who worked closely and reciprocally with Donovan Hill to craft the beautiful timber elements for which the house is so well known. 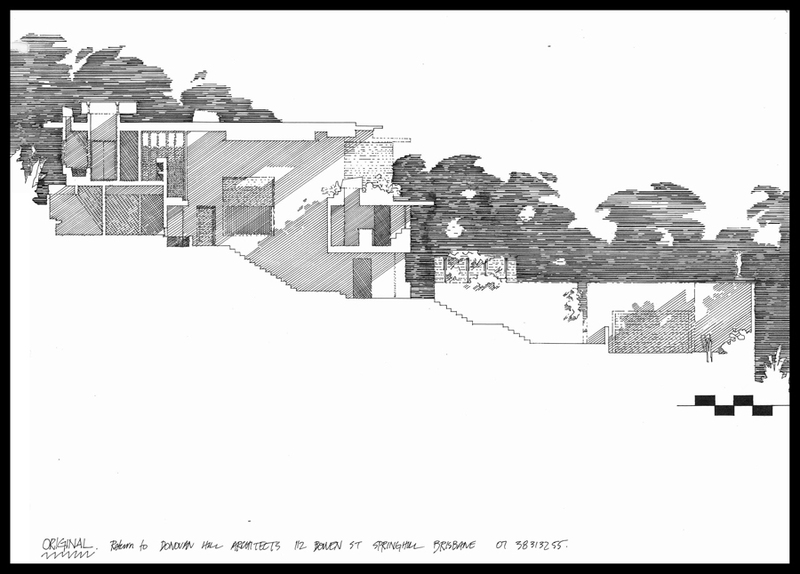 Reflecting this emphasis on process, Donovan’s presentation was not restricted to glossy finished photos of the house, but also included hand-drawn construction details, construction photos and recent, lived-in photos. 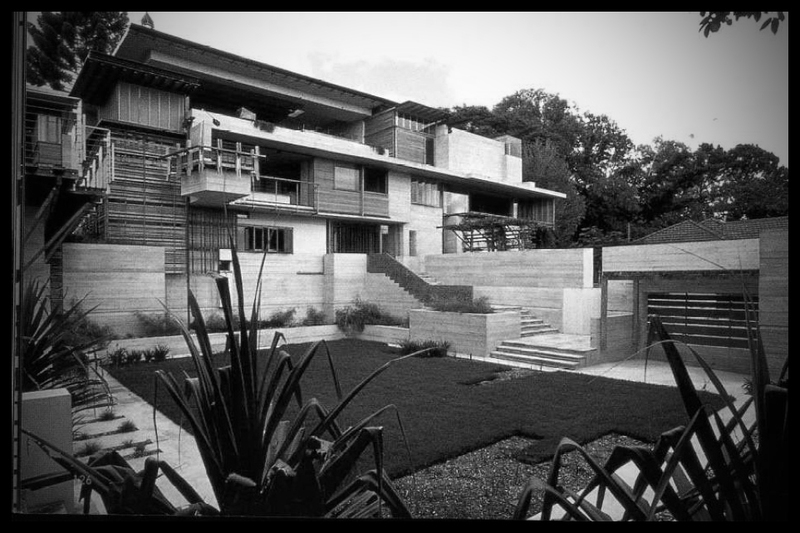 The resultant collage provided fascinating insight into the labour of making that went into a house that has been cited by Phaidon as “one of the great houses of the 20th Century”. Santos Place and AM60 Office Tower are both commercial projects with, as Donovan put it, an emphasis on the typical developer’s priority of maximum leasable floor space. Representing a project typology that has only surfaced within the Donovan Hill oeuvre within the last five to ten years, both were produced within a design and construct contractual arrangement. This is a commercially oriented approach where the architect is employed not by the client but by the builder, who is focussed on delivering the project at a guaranteed price for maximum profit. Proving the terrible soullessness of this arrangement, Donovan took us through the deeply disheartening story of Santos Place, that saw idea after idea stripped away to the absolute minimum. Design concepts that explored the colours of place, opacity and transparency, and an evolving connection with sunlight all ultimately found their way onto the cutting room floor. Despite loving C House, despite being inspired by the historical work of Donovan Hill, and despite recognising in their older designs an invaluable sensitivity to materiality and climate, we were thoroughly bewildered by Donovan’s presentation. From the nature of the questions afterwards, and from chatting with colleagues as we left Walsh Street, it became clear that we were not alone in this sentiment. The Santos Place story was an almost archetypal illustration of the commercial developer’s disregard for the quality of the built environment. Despite Donovan’s herculean efforts, the finished building looks much like any other skyscraper and could easily be shoehorned into any other climate and culture. These are qualities at direct odds with the past works of Donovan Hill. It might have been an entreaty to push harder for design-focussed outcomes within the commercial building framework, but Donovan instead presented it as a story of silver linings, one that produced many unrealised but nevertheless valuable design ideas. Similarly, when we commended C House for its intimate and meticulous craft-driven philosophy, Donovan curiously denied its craft origins, arguing the fastidious semantic point that it was not craft-driven but crafted. In other words, while the project was always intended to be of the highest possible quality, it was never intended for it to explore the craft of making. The craft just happened, accidentally. With great respect for this master of fine architecture, who is Donovan kidding? C House is an undisputed triumph of craft. Whatever his intentions, they speak nowhere near as loudly as the process that facilitated this remarkable project: a process that prioritised quality; that placed craftsmen of talent and integrity at the heart of the project; that clearly benefited from a client passionate about the place he was to call home. Why would an architecture practice shift from this story to the one of Santos Place? A story where design had to be fought for; where ideas were regularly and unceremoniously stripped; where the individuals at the heart of the project were passionate not about design but profit margins. Herein lies the crux of the matter: why on earth would Donovan Hill, an architecture practice with a rich history of high-quality, craft-driven, award-winning residential design, not only shift its focus to developer-driven commercial construction but then merge with a national architecture practice like BVN? This is not to diminish the quality of BVN’s work. Some of it is quite good. But BVN has a documented history of absorbing smaller practices and appropriating their market niches. Donovan Hill’s 30 or so Brisbane staff have now been subsumed within BVN’s 250. Their studio is dwarfed by BVN’s other offices in Melbourne, Sydney, Canberra and, if the grapevine is to be believed, soon-to-be-opened offices overseas. Even the post-merger website has not bothered to update its domain name, surely indicating that after a suitable transition period, the Donovan Hill suffix will be quietly dropped. We just don’t get it… Or do we? For a lecture series concerning itself with material, the choice of Donovan as its inaugural speaker was both inspired and disastrous. Against all expectations, Donovan embodies an architecture that used to concern itself with material but has given this up in favour of commercial success. Perhaps the secret lies in the title of this article. To build is good is a phrase with many potential meanings. It could mean, simply, that to be involved with construction is good. It could have a slightly more nuanced meaning: that having one’s architecture built is a good in the Platonic sense, the necessary expression of architectural ideas. However, our less charitable interpretation of the phrase, and one that we remain shocked to discover fits well with Donovan Hill’s history, is that to build is good, no matter the quality of its architecture. We asked Donovan whether the shift from small buildings to larger, commercial ones was a planned move or accidental. He responded by saying that he and his partner, Timothy Hill, never had any plans at all. Donovan Hill started as an opportunity for two guys to make buildings and was never formalised, never shaped by a 20 year plan. 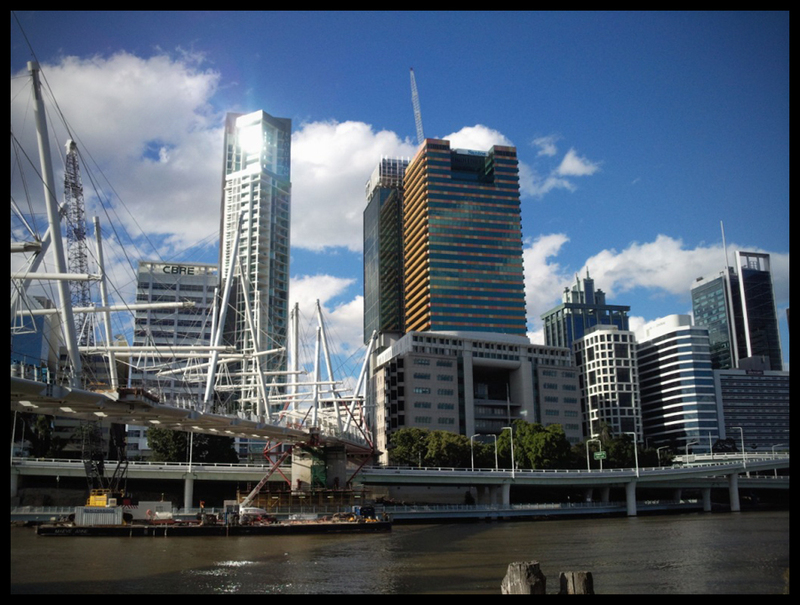 The shift to commercial typologies happened simply because Brisbane was building lots of skyscrapers, the opportunity came along and they took it. With this vital insight, the inexplicable trajectory of Donovan Hill becomes less so. Like many architects, including our own, their opus has been powerfully defined by opportunity: maybe at first by their friends who wanted to build houses; later by the broader Brisbane construction industry. A cynical voice would suggest that Donovan and Hill are now selling out, cashing in on their hard-earned market niche. But the architecture profession is hardly in the business of furnishing golden parachutes. Perhaps the merger offers them the chance to escape the results of their opportunities. Could it be that they have grown dissatisfied with the skyscrapers, but feel an unshakeable loyalty to the welfare of their staff? We can only speculate. We hope though, for the sake of good architecture everywhere, that the secret plan is to strike out once again, fresh and anew, two guys wanting to make buildings.